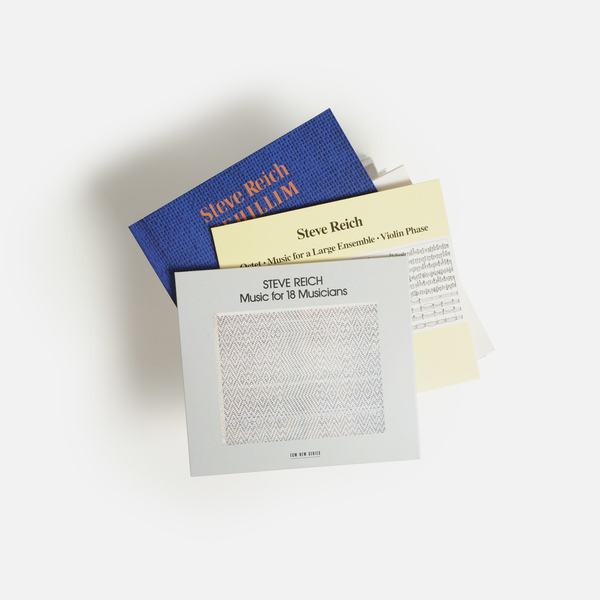 After some one-off studio LPs for a variety of imprints, composer Steve Reich found his first label “home” with ECM Recordings (his second, Nonesuch, came after this triptych of recordings). Initially known primarily as a jazz label, ECM had decided to diversify its offerings to include classical artists such as Reich and Meredith Monk. The first of Reich’s ECM recordings, Music for Eighteen Musicians, sold more than 100,000 copies, which certainly encouraged producer Manfred Eicher to continue to take on ambitious classical projects, ultimately starting the New Series in 1984 to present Tabula Rasa, the first recording in a long term collaboration with Arvo Pärt. The Reich reissues contain an informative set of liner notes by Paul Griffiths, who helps to provide valuable context for these works as part of Reich’s output. Music for Eighteen Musicians is a totemic Reich work, and the performance here is authoritative, lively, and dramatically paced. Its successor, Music for Large Ensemble, luxuriates in an expanded sonic palette with a greater number of winds and strings. Violin Phase is a holdover from Reich’s early style of patterned “phase music,” while Octet hews close to Music for Eighteen, providing a taut sound world filled with contrapuntal excursions set against Reich’s ubiquitous ostinatos. Whereas Violin Phase is a backward glance, Tehillim looks forward to Reich’s many texted works of the 1980s and beyond. That said, its use of canonic drums and clapping also bring it full circle to the composer’s early experiments. Another connection: the titular psalm texts are rendered by four sopranos, put in a similar register to that of the singers in Music for Eighteen Musicians. While also sustaining substantial growth and departures, Reich’s repertoire is filled with connections such as these. The ECM box may not tell the full story of his music, but it sketches the outlines of its trajectory in admirable fashion.